It’s been a rough month on the health front. Nothing major, but just annoying and limiting to plans made: first food poisoning a few weeks back from bad oysters, now a persistent summer cold probably from a fellow passenger on the return flight from Ireland who had not learned what all school kids now know: sneeze and cough into your arm. As a consequence, I did not get to finish the new/old song mentioned last week as I’ve been too croaky to sing anything, and generally baffed out anyway. Some work has begun, so I hope it will be done for next time. In the interim, please enjoy this read from Digital Music News, on a theme I have written about before, but explores the angle of the major labels vs. new talent (sic) Danielle Bregoli aka Bhad Bhabie even better of Cash Me Outside infamy. Nice to see creative spelling making a comeback; I missed you Slade! Until next week, I will try to be well! Nice to be back with you, glad you could stick around! While I was away, it seems there has been a new kid in town. The Peppery Cat, home to many successful and super well-attended Blues Jams with guitarist extraordinaire Mike Sedgewick, has changed hand over the summer, and rebranded itself The Beach House. It is already garnering excellent reviews for the quality of the food offerings. Not content with the extensive renovations which really lighten up the atmosphere, owners have committed to providing live entertainment for their patrons. The Beach House has lined up what looks to be a stellar roster of soloists and duos into 2018, with many of their performers coming back on a monthly basis. They are showing a strong commitment to entertainment. Two residencies anchor the week: Wednesday evenings feature guitarist Bob Wegner (from the hit musical We Will Rock You), and Saturday nights will have Amber Durette starting in late October. Sunday afternoons will close the week with a jazz brunch with Wayne Neon or Glendon James on rotation. Thursdays and Fridays will feature a variety of great performers, many of whom I know, and I am chuffed to be part of that line up, on Thursday, November 2. Please continue to check the sidebar for upcoming shows. I’ll also try to reach as many of you as possible as well through the usual social media channels. Next week, I hope to have ready for upload a first mix of an old/new song that I’ve been workshopping for a bit. Until then, be well! After all that build up regarding sitting in at a local pub, the whole thing just fizzled like dew on an Irish Spring (but I like it too). A brief conversation with the barkeep made it plain that “All musicians welcome” as stated on the sandwich board outside Ma Bakers required the addendum “as long as you only play traditional Irish music. All others, feck off!” Okay, I’m exaggerating but I did not want to make a cultural faux-pas, like mentioning the war to Germans, ordering a black-and-tan in Ireland or playing Bowie covers at an all-blues jam. Nevertheless, time was well spent and I recorded a song written back in Toronto, but entirely captured here in Ireland on my pokey iPad Mini, 1st generation. Results are as good as can be expected, and I’ve posted it below. 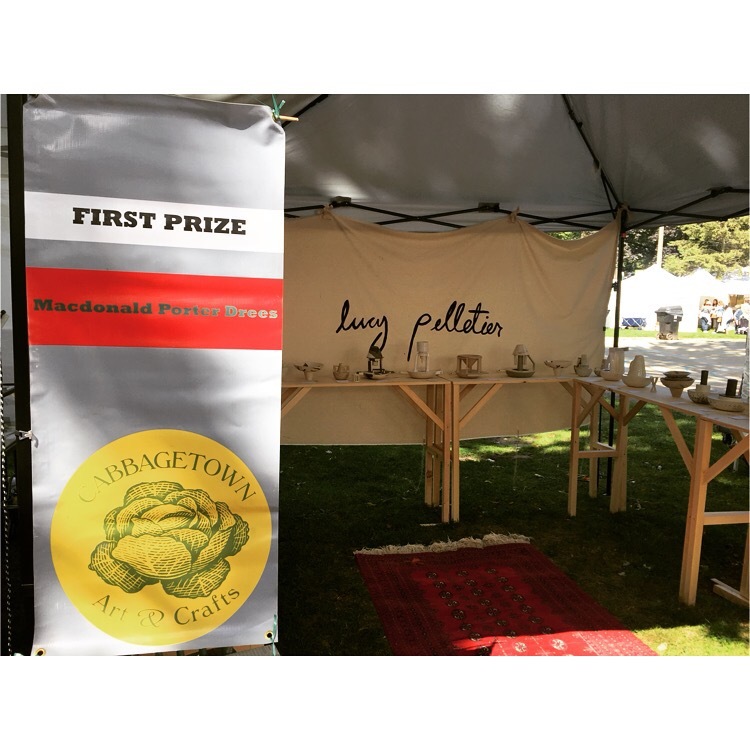 More Good News Eldest dot has earned first prize for her singularly original pottery at the Cabbagetown Arts & Crafts sale this weekend. Family and friends are very proud of her! On that high note, be well! Curiouser and curiouser. That seems to summarize the past week. Many intentions were stated, but some did not come to pass, for good and sometimes unpleasant reasons. With expat daughter and boyfriend visiting, sightseeing became the priority (more on that later), and by the time Thursday rolled around, the aforementioned open mic escapade at Ma Bakers was one-too-much activity for the day. Hoping for this week instead. Recording of the new song has gone well so far but I have now encountered the 8-track limit of my old iPad Mini. It’s bouncing time now. Mostly though, a batch of bad oysters (we presume, but likely since 3 of 4 of us ate them and the same 3 ended up sick) had us waylaid for a couple of days. A completed recording looks promising for next week’s post. Please check back! Despite some hangups, we were able to get to one of the great natural wonders of the world, the Giant’s Causeway in Northern Ireland. My somewhat somber tribute to that inspiring location (i.e., Star Trek the Motion Picture) is on the right (or below on mobile). Classic rock fans should get it, and might be interested in the backstory. Worth the read. Time to go finish recording that new song now. Until next week, be well!